Our ServicesAt Tradefit 4U we undertake many large commercial projects. We are experienced in carrying out this work efficiently and within budget and time schedules. About UsWe are passionate about investing our training with all out team members and firmly believe in the ethos of transforming business performance by having the right qualified people in place. AccreditationsTradefit 4U are members of CHAS, Certass, Constructionline and CSCS. Health and safety is our ultimate concern and we apply all recommended saftey working practices. Company ValuesAll of us at Tradefit 4U aim to provide quality of product - Positive, driven and hardworking - Honesty and integrity - Fair value for money. Case StudiesCheck out of case studies and see what Tradefit 4U can do 4U. We have come a long way since our formation in 1999 as a domestic installer of UPVC building product. The company has grown in to one of the most respected best qualified forward thinking commercial and domestic companies in their field. Working alongside some of the best manufactures of UPVC, Aluminium, Composite and Timber Windows doors conservatories and roofline products. Supplying and fitting guttering windows, doors and conservatories in Thanet and the southeast. Recommended by councils major building and construction companies across the UK. Trade Fit 4u is now Kent county council trading standards approved and we have joined up with Checkatrade. 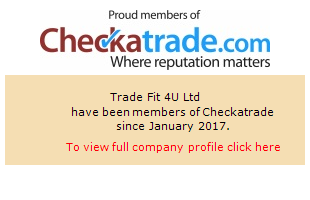 Check out our Checkatrade reputation profile here. You can read our reviews on the Guardian website here. We are also featured on the Canoports UK website here.